Richard Meyer is an author and artist with a passion for the natural world. He began his zoological career working with Sir Peter Scott (Founder of the World Wildlife Fund) at The Wildfowl Trust, gaining a doctorate for his work on returning the Red-billed chough (also known as the Fire raven) to Cornish cliffs. He has written or co-written twelve books, illustrating many of them. He is a qualified teacher and freelance zoologist, but as respite from the woes of conservation, a passion for painting came to bridge art and science, becoming essential in contemplating the real world and humans' place within it. 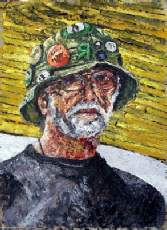 Richard’s paintings can be viewed at his online gallery. He also writes children's adventure stories - tinged dark green with supernatural undercurrents. After working with Peter Scott and meeting great wildlife artists like Philip Rickman and Keith Shackleton, his work in ethology (animal behaviour) was led by luminaries like Niko Tinbergen, Konrad Lorenz and Gerald Durrell. The intimate bond between animal and environment with its myriad of inter-connections informed his love of landscape. Maturing emotional responses fuelled an intense passion for Fine Art which came to overtake 'mere' illustration. It became the wellspring of his life. Even as a child, Richard suspected that Man corrupted Nature: wrestling Her to his own ends - be it farm, garden, dog, horse etc. As he matured he noticed he did this to the human body too: imposing his will - moulding, adapting, shaping. So, as a lonely child and later an intellectually remote adult (never a member of a club or a social group of like-minded souls), he was at peace with nature in the raw – wilderness. And mystical wonderful women came to represent the secrets of nature because they too were forbidden. Nature and the countryside, represented a safe retreat and remain so. But in a sense, fine art and wild nature are conflicting passions. Conflicting because one is about survival of the natural world, and the other is about one's own personal integrity and sanity; Richard soon found that worry about one endangered the other.